Playing outdoor games gives kids many benefits that help them stay fit and healthy. We here at CubbyKraft understand how important this is and it is the basis of why we strive to build the best outdoor toys money can buy. It is also why we like to give parents tips on kids fitness on our blog. Act out an action song on the front porch or deck of your cubby house. Singing a fun kids song while acting out the motions is tons of fun and will be that much more fun when they do it outside in their very own deck. Here is a great list of Kids Action Songs. Follow the leader is an oldie but a goodie. 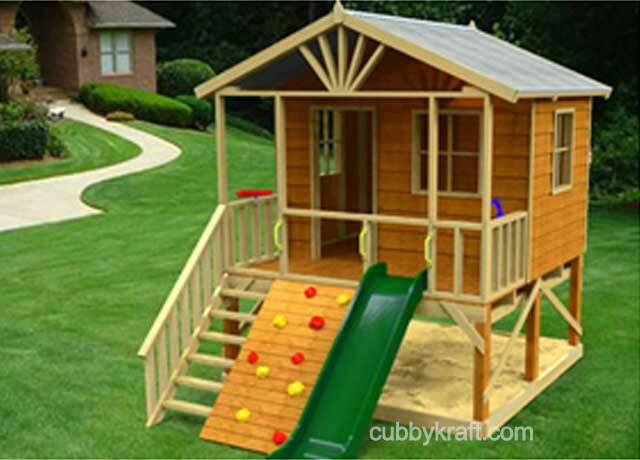 When you have a cubby house or fort with a slide and climbing wall, there are tons of places to lead the group and have lots of fun. Have a nature scavenger hunt. start by making a list of things your kids can find in the nature in your back yard. Give them the list and a bag so they can collect these things. Allow older children to go with younger children work as a team. Be sure to put abstract things like ‘something green’ or ‘something round’ on the list so the kids will have different things to show off from their collection when they are done. Hide treasure and give your kids clues where to find it. You can draw out a treasure map and then cut into four equal pieces. Have your children guess the answers to riddles – or spell their spelling words – to get the pieces and put them together, taping them to the back wall of the cubby house or fort. Then they can use it to find the treasure. Good old fashion game of Let’s Pretend! What will their cubby house be today? A rocket ship? A tree house on a deserted Isle? Anything they want it to be, all it takes is their imagination.